Blizzards! Gales! Floods! Torrential Rain! …but what’s in store for Reigate this weekend? East meets Wet = SNOW! same daffodils same day 2012! Saturday am: heavy snow falling across our region: check twitter for updates. 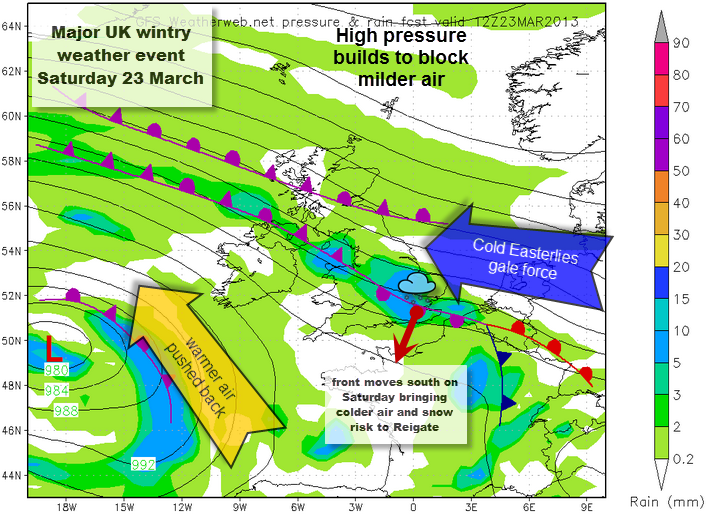 A major wintry weather event is unfolding tomorrow and over the weekend across the UK. This could bring potentially hazardous weather Friday through Sunday almost anywhere in the UK so if you are travelling please take care and check weather warnings for your destination. Reigate remains comparatively sheltered throughout but even here we have the threat of seriously miserable and cold weather with an evil mix of heavy rain, cold winds and sleet turning to snow over this weekend. Snow amounts and depths for us still uncertain though. Cold Polar Easterly winds will increasingly undercut and push back the advancing warm air brought in by a vigorous depression out west in the Atlantic. Where these air masses meet is essentially where the heaviest rain and snow will fall: the fronts move north on Friday and then move south on Saturday as the cold air wins out over the warm: it is the move south on Saturday which could bring some SNOW to Reigate. The SW is due to get torrential rain, whilst anywhere north of the M4, especially on high ground, could see heavy snow and drifting in high winds. Reigate remains comparatively sheltered throughout this episode BUT if you are travelling anywhere else do heed weather warnings. Whilst Reigate will escape the worst of all this, we are due to have a pretty cold, windy, very wet and sleety and at times snowy weekend weather wise! Friday sees fronts crossing the country and bringing increasing rain to Reigate during the day. Overnight into Saturday might see this rain turning increasingly icy and sleety. Wind chill 0°C to -4°C. Saturday will be a truly horrible day with temperatures falling throughout. Cold winds (feeling -5°C) and heavy rain will turn increasingly sleety and turn to snow anytime but with greatest risk in the afternoon. By the afternoon, however, the heaviest precipitation should be dying out over Reigate so any snowfall should be light by that stage. Saturday could see totals over 20mm of precipitation (mostly in the morning as rain); snow lying could amount from 0cm to a few cm especially on the Downs by evening. Any snow conditions will be worse to the north of the region and over high ground. Sunday sees even colder weather and a threat of further snowfall from nearby fronts to the south. Still uncertainty around this so keep watching forecasts. Wind chill -8°C so feeling very cold indeed. Drier later though. The rest of the week looks cold, frosty and dry with gradual recovery of temperatures and the hint of more spring-like temperatures next weekend! Take care this weekend if you are travelling anywhere in the UK: floods in the SW, blizzards and snow up North. If you don’t need to travel, you should probably wait until Sunday or Monday when things have calmed down. What a difference a year makes: check out the daffodil pictures: taken one year apart!